And Carmel By The Sea, or simply Carmel, struts its stuff around every corner, in every courtyard, art gallery, bistro, bakery and restaurant with a view. 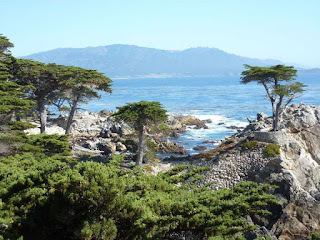 Several years ago, we drove on the outskirts of Carmel on our way to San Francisco from Big Sur. So returning to this unique enclave of the quintessential "life up on the hill" has been on our Bucket list for years. There are no bad views in Northern California's world apart from the morass of humanity that is found in Southern California. There is an endearing vibe, a zen quality, if you will, of utter relaxation, about this enclave of the rich and famous, ne'er do wells and old hippies with money. 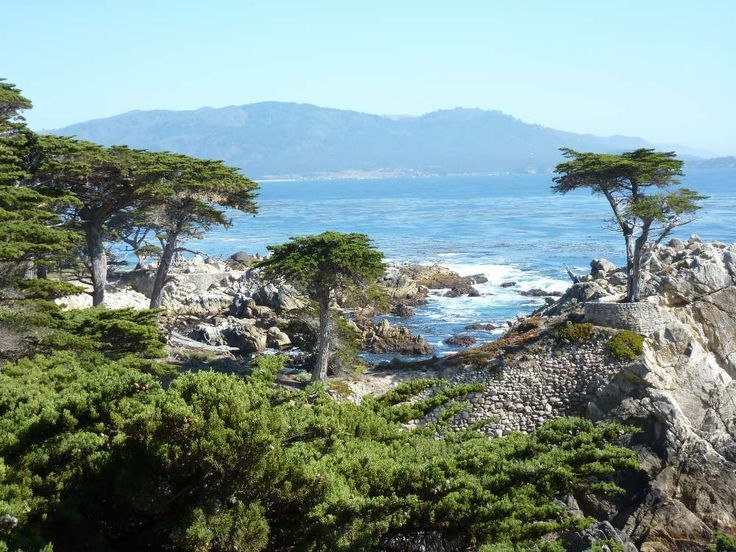 Founded in 1902, Carmel, with its natural beauty and legacy of artistic residents, including painters, sculptors, poets, writers and other assorted creatives has endured as a place to be seen and experienced to be appreciated. According to Wikipedia, in 1910 it was reported that 60 percent of Carmel's houses were built by citizens who were "devoting their lives to work connected to the aesthetic arts. Early City Councils were dominated by artists, and the city has had several mayors who were poets or actors, including Herbert Heron, founder of the Forest Theatre, bohemian writer and actor Perry Newberry, and actor-director Clint Eastwood." I have sung the praises of AIRBNB before on this blog. We have stayed at AIRBNB properties in the States and in Europe. Once again, the grand daddy of peer to peer vacation rentals did not disappoint. Just outside of Carmel we found this private guest cottage with a stunning view of the Pacific over Point Lobos State Reserve, considered to be the crown jewel of the California park system. Complete with small kitchen, rain shower bath, wood floors, large skylights, fireplace, comfy bed and floor to ceiling glass overlooking a large deck and the Pacific, The Epic Ocean View Private Lil Cottage served as NOCAL Central for our stay in the Carmel area. Because it is only five minutes from Carmel and just off California State Highway 1, access to downtown, other must sees, shopping and restaurants, including numerous places on the famous coastline road is quick and easy via car. With the tag line - Drive First Class, Pay Economy - SIXT Rental Car is the latest to jump into the travel/rental car market Stateside. And if you think that's just a marketing slogan, then you would be wrong. After our arrival at San Jose Airport, we picked up a tricked out BMW 5X SUV. After a slight learning curve with all of the new millennium gadgetry, we were on our way in the largest luxury SUV made by the venerable German automotive perfectionists. Now for the "NO WAY!" you say. The total rental? Including federal-state-city-county-value added and California is broke taxes, enviro-natzi fees, carbon footprint assessments, airport payola, the works - the total rental was $252 for four days. Same car, same time - Budget Rent-a-Car - are you ready? $782!!!!!!! Sometimes better mouse traps are just that - better mouse traps. Unfortunately, SIXT is not everywhere in the States yet, although they are in most major cities, so you need to check their web site for locations. They are everywhere in Europe, so a CHEAP NOMAD WHO LIKES ARRIVING IN STYLE RECOMMENDATION - check out SIXT next time you need a nice ride for a song. Next time - Wine, Food and Clint's Place - Amazing! !